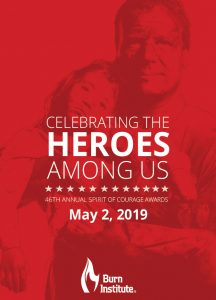 Join us on May 2 at the Sheraton San Diego Hotel and Marina on Harbor Island for the 46th Annual Spirit of Courage Awards Banquet. Learn the stories of everyday heroes who risked their lives to save another from a fire related accident. The event includes a cocktail hour, where you can meet our worthy recipients, followed by a banquet dinner and awards ceremony. This prestigious event will leave you feeling inspired by the courageous actions of our recipients.